Can it be done? Can it really be done? The answer is yes. I've been doing it. I've been making a living from music for the last seven years now. Living the dream. Doing music full time. "Have you made any significant money selling your music digitally online or using the Internet to sell CDs? I'm truly curious, and thinking about adding a person or two (if I can find one) to a Road Rally panel on the subject this November. What do I mean by significant money? Enough that you were able to quit your day job. We've all been bombarded by the hype surrounding the DIY career path, but as I've said in previous rants, I haven't seen much evidence of SIGNIFICANT success. Has anybody on this list made enough money that you can, or already have walked away from your day job? Please send emails to letters@taxi.com"
So I sent Michael an email. I'll be interested to see if I hear back. I'm sure many of you skeptical musicians are out there going... "yea, right... how much is this guy REALLY making from just his music?" When I responded to Michael, I added it all up. I was quite surprised. It was more than I expected. If you include CD sales, digital download sales, sales of my sheet music, concert ticket sales, performance fees and royalties, I made over $100,000 in the last 365 days. That's over 100K just doing music in the last year. That *doesn't* include income from sales my book, How to Promote Your Music Successfully on the Internet. Now, lest you think I'm sitting here rolling in the dough, you need to realize that my EXPENSES ate up half the income I made last year. It takes money to make money. But when all is said and done, I'm making a decent living just doing music. Now you're thinking, "wait, his expenses were over 50k just to make that 100k? Well, I don't have 50k and there's no way I can do that!" Actually, yes you can. You see, I started out promoting my music online back in 1995 with NOTHING financially. All I had was a web site and a couple CDs to sell. My only ongoing expense when I started out was the cost of hosting my web site. I started from there and built my music business a little bit at a time. The more money I made online from my music, the more money I had to invest back into my career. So it was a very gradual thing. But, by 2001, just six years after I started promoting my music online, I was able to quit my day job working for Symantec Corp (SYMC) and start doing "just the music." Here's the kicker... most people think you have to be a ROCK STAR to make a good living at music. Not true. Guess what I do? I'm a pianist. Just a simple piano player. I write and arrange simple, beautiful piano melodies. 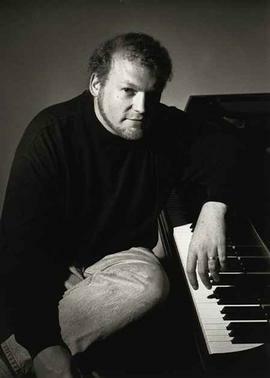 You can see my web site at http://www.davidnevue.com or visit me on MySpace at http://www.myspace.com/davidnevue if you'd like to hear that. So I spend my days promoting my music online. I'm here at home with my family. I get to see my kids all day. Get to practice basically whenever I want. I book my own tours all through my mailing list and so I get to travel and perform about four months a year as well. I am blessed beyond anything I could have ever hoped for. Just doing music. Just living life. Thank you Lord! So yes, you can make a living doing music.... providing that your music is music people want. That's one of the key things you must have that you can't get around. Your music must be music that people fall in love with - music they want to own - music they want to invest in. Now you might be saying.... "David, tell me all your secrets to making money with music!" Well, there aren't secrets. Just common sense and a basic understanding of Internet marketing. And before you ask... no, I don't do consulting. You know, a lot of people have offered me huge sums of cash to help them with their own music careers. But I always pass on doing that. Why? Being a consultant isn't what I want to do with my life. I'm a musician. I have no interest in spending my days on the telephone! I'm a musician - a professional musician. That's what I do. That's who I am. Although I don't offer consulting for artists, I do keep up the Music Biz Academy web site. There are lots and lots of music business articles here written by not only myself, but many others in the industry that I respect. 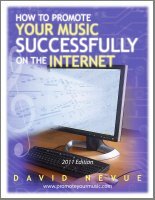 And there's my book, "How to Promote Your Music Successfully on the Internet" for those who want a step-by-step guide to how I do what I do. I wrote that book - a labor of love - for all of you. Anything I would talk to you about in a consultation is in there. So go out there, work hard, make music, do what you love what you do. And if you're making a living doing music full time, drop Michael Laskow of TAXI an email at letters@taxi.com . He wants to hear from you, too. That's an incredible amount of money you made last year as an unsigned artist. Of course, it's all a product of your amazing music and hard work. I've seen articles and sites on the internet that ask about people who quit their day job and are doing music full-time. And I do mention your name. There is another you may have heard of - Jonathan Coulton. Also, John Taglieri. I don't know why people doubt this anymore. You are my role model, no question about it. Thanks so much, Sam. Glad to help out. Thanks very much for taking the time to read! Thanks so much, Jim. I really appreciate it. For anyone who is curious, I never did hear back from Michael Laskow of TAXI on this.